Go to the Sections tab in your Options. Start by logging into your Advocacy module. 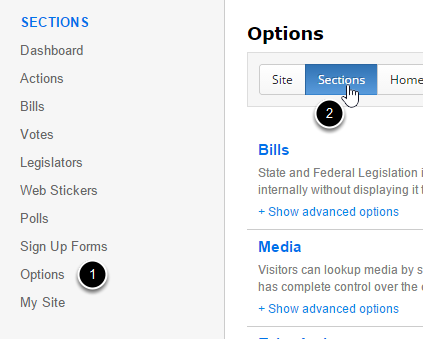 (1) Select Options in the left side bar. (2) Select the Sections tab. Turn the RSS feed on. Scroll down to the RSS and switch it to On. Make sure to Save and Publish. Click the RSS feed button on your Action to get the URL. Go to the public view of one of your Actions. At the bottom of all of your Actions there will be an RSS feed button that you or anyone can click that will take you to the URL of your RSS feed. Then you can grab the URL and put it into your RSS widget or whatever you're using on your site for the feed.